Company holiday parties are a long-standing tradition. They offer hard-working, by-the-book employees a semi-sanctioned opportunity to cut loose, throw back a few cocktails, and say/do things they normally wouldn't at a staff meeting on proper email usage at 2:30pm on a Tuesday. With the odds of awkward encounters with costumed and inebriated coworkers at their highest, Halloween parties may be the penultimate workplace holiday setting for things to just get weird, for better or worse. 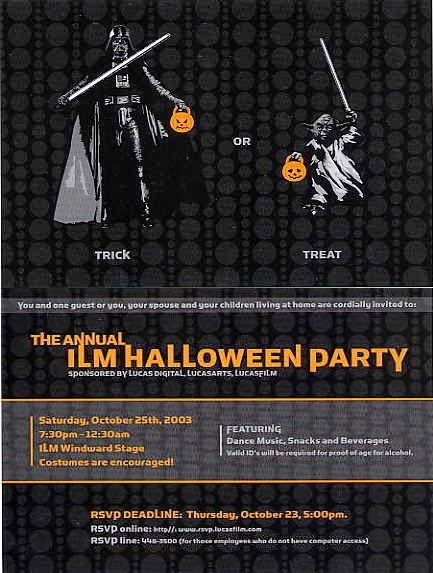 What we have here are a selection of invitations to ILM's annual Halloween Party. Each are viewable in the Archive Database, but it's kind of fun to see them all together in one place. 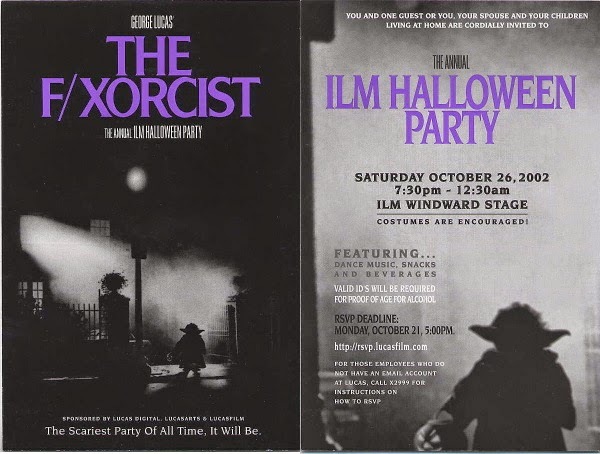 This first invitation from 1998 represents a neat play on the Eerie comic series that ran from March 1966 to February 1983. Poor Vader gets his head smashed by a Martian as Leia shrieks in horror. The next two feature a familiar scorned Gungan paired with often parodied horror films, The Blair Witch Project (1999) and Poltergeist (1982). I feel like not incorporating the old LucasArts stick-figure logo with the former was somewhat of a missed opportunity. 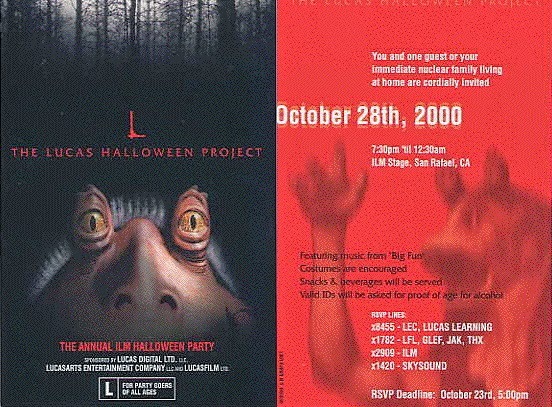 By 2001, it seems that they've fully embraced Jar Jar's maligned status in our popular culture. 2001 - Episode II: It knows what scares yousa. This Yoda/Exorcist mash-up from 2002 may be my favorite of the group, perhaps because Yoda still retains somewhat of a puppet-like appearance and I've always been a fan of the poster that inspired it. 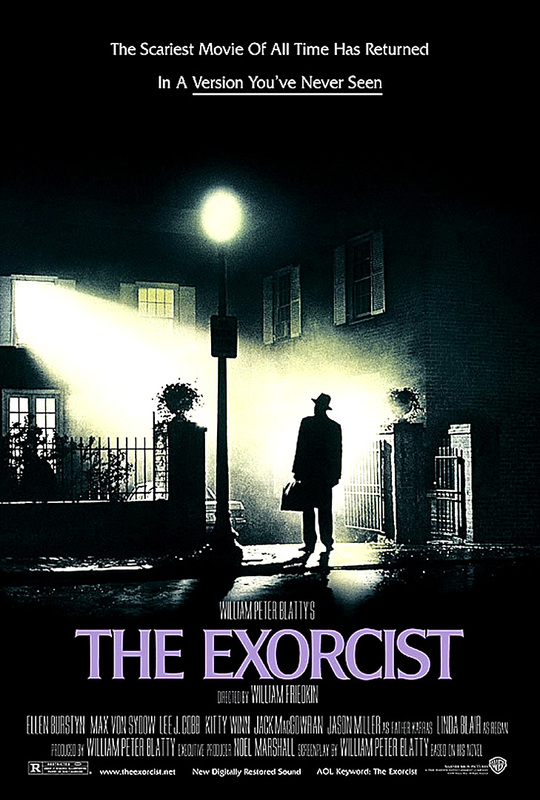 I vividly remember seeing The Exorcist for the first time when it was theatrically re-released in 2000, and at that time the tagline "The Scariest Movie Of All Time Has Returned" (as seen on this poster) rang true for me. 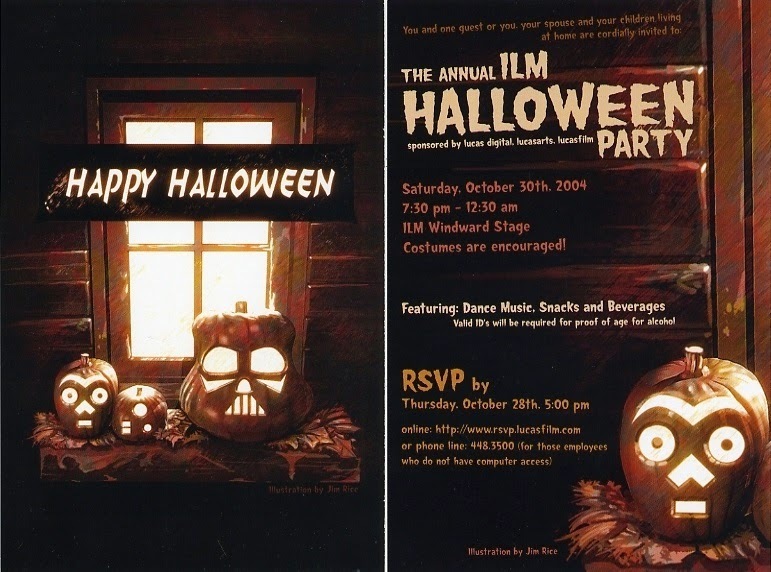 Invitations from 2003 and 2004 were a little more generic, but still charming. The droid jack-o-lanterns in the latter are particularly amusing. Threepio definitely has a vintage Droids look about him. 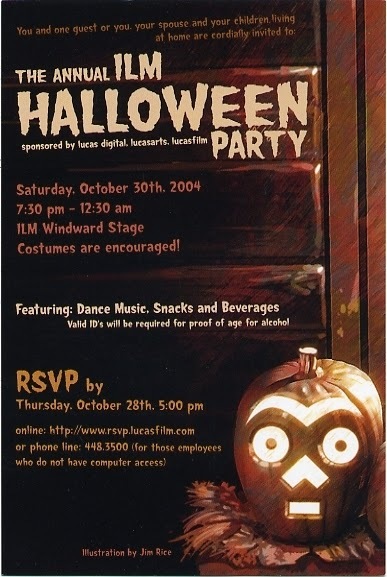 This final invitation from 2008 is unrivaled in terms of style. The pulp novel look is pretty brilliant. If anyone knows what may have been the specific inspiration for this one, let us know in the comments. More than a decade ago, Star Wars / C-3PO focus collector Bill Cable was lucky enough to find a nice lot of Lucasfilm licensing slicks from the ESB and ROTJ eras, which he published here. 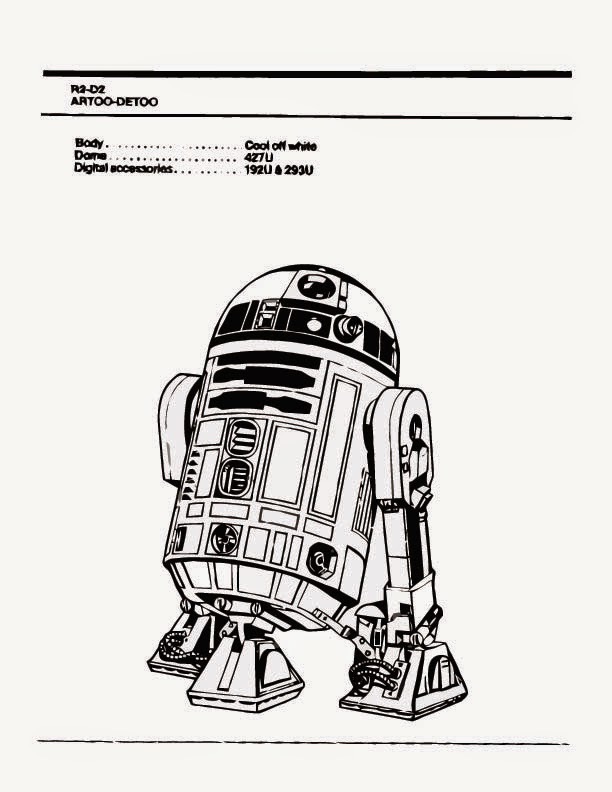 These slicks were part of the many paperworks internally produced at Lucasfilm licensing for distribution to licensees in order to design, market, promote, or advertise their products. These individual black& white slicks may not be as gorgeous as other toy packaging (eg. cromalins, proof cards, or even photo-art...), but they portrayed major characters from the movies, and some of them may actually look very familiar because they were used, or widely used by various licensees. It's always interesting to see material provided by Lucasfilm to licensees, and how it was used to design packaging for marketed products and/or advertising. But it's even more interesting when it comes to the same material used by foreign licensees, as it happened with the French MECCANO licensee on the toys/games product range. When I saw Bill's website, those artworks were instantly reminiscent of advertising in my memory of a child who grew up in France in the 1970-80s. I took a closer look and tried to match them; THREE of them were a perfect match in children/youth French magazine PIF Gadget and the Palmito cookies vacuformed plastic cards premium. 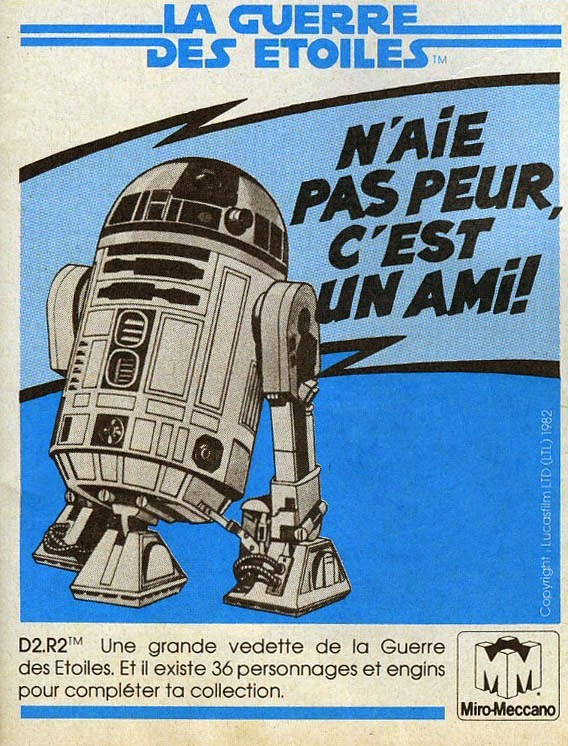 The R2 slick was used on the famous PIF Gadget 'blue ads' series from the ESB era - a quarter of page insert depicting a major character/vehicle and promoting the 36-action figures available. 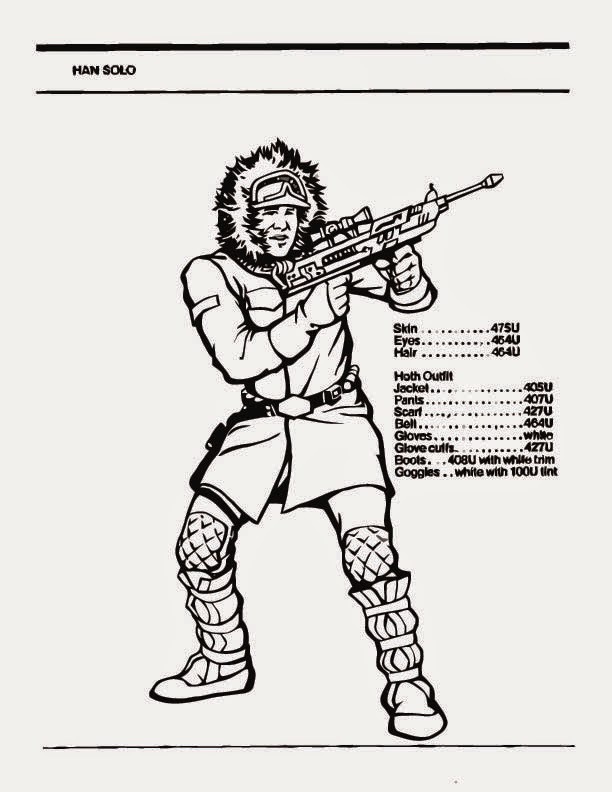 The Han Solo Hoth gear slick was also used on both PIF Gadget ads and Palmito cookies plastic cards. 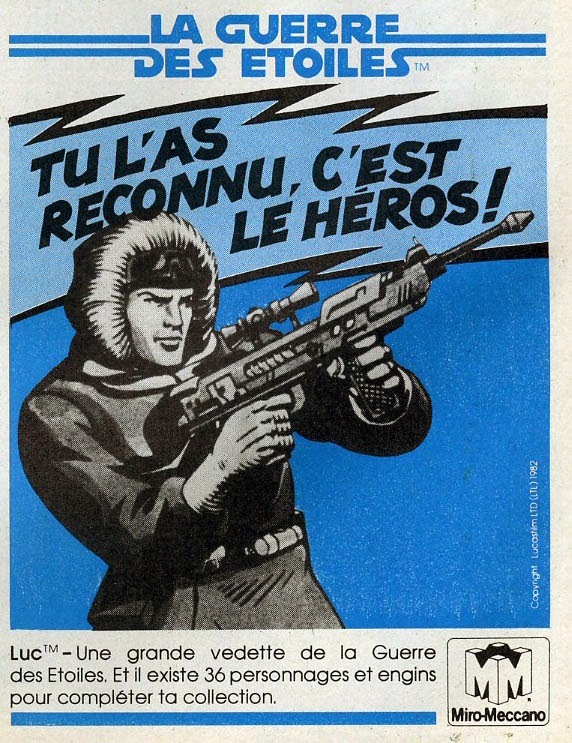 However, you'll notice that the face/bust drawing were altered to make it more 'aggressive' and that it was used with the 'LUC' (French for Luke) name instead of Han. There is one more interesting thing to assume based on these connections, which confirms Bill's theory of probably more licensing slicks available back then: many artworks used on Meccano PIF Gadget 'blue-ads' series and Palmito cookie cards, are missing from Bill's find. 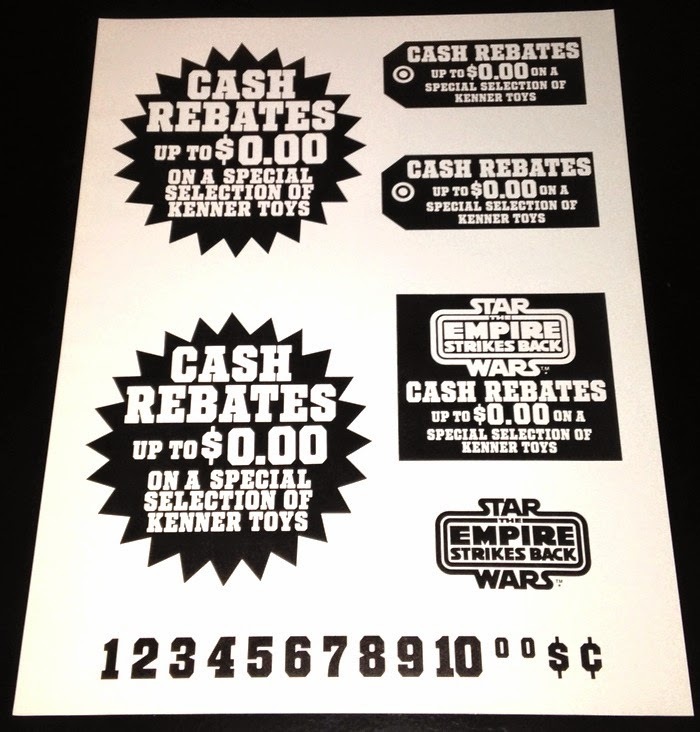 During the vintage era, Kenner ran a number of rebate programs. These encouraged retailers to participate in advertised rebate campaigns designed to drive sales. 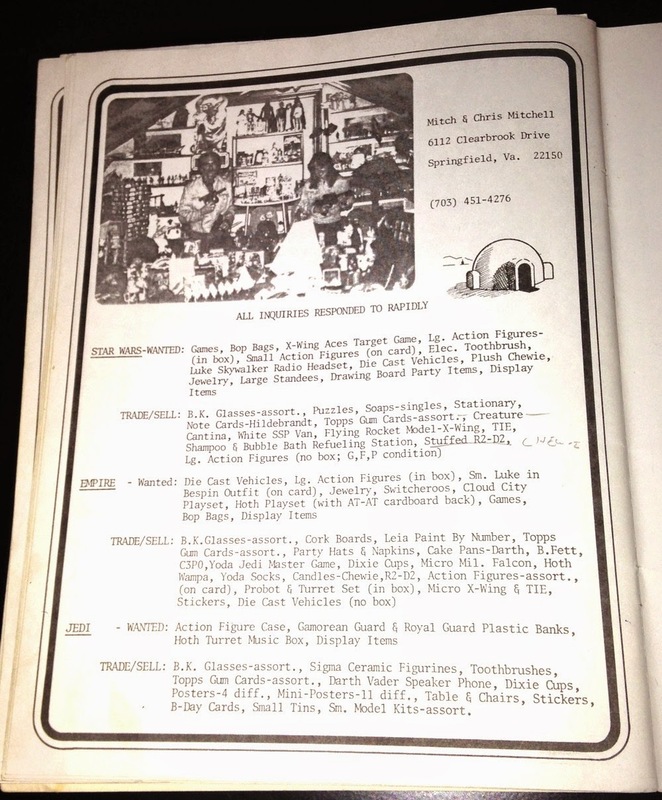 The kits distributed through Kenner's sale force typically contained a brochure and a folder. The latter item housed a number of clip-art sheets, which allowed retailers to design their own print ads. 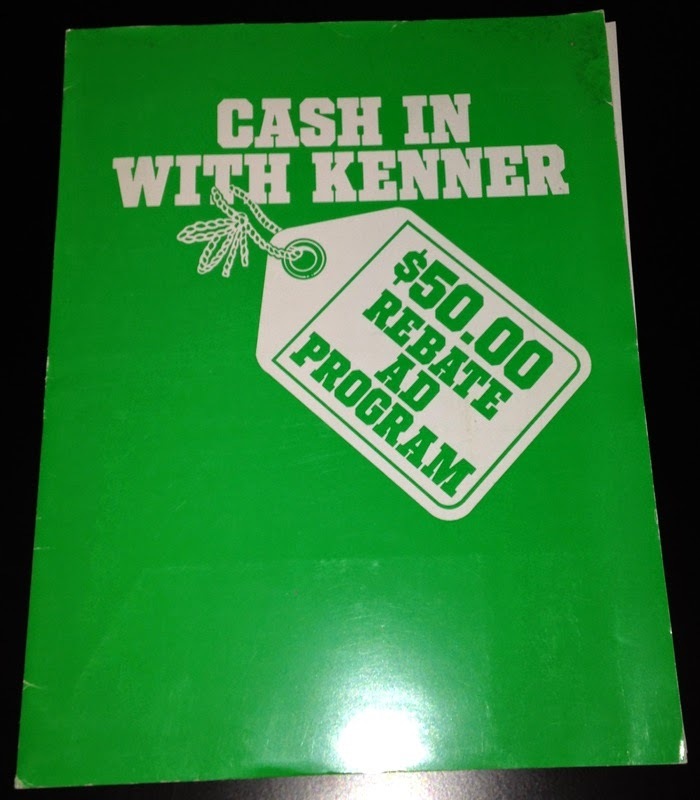 Here you see the folder for the 1980 "Cash In With Kenner" campaign. And here's a clip-art sheet providing a number of graphics as well as some numerals. Retailers would use the numerals to add their own prices and combined rebate values to their advertisements. 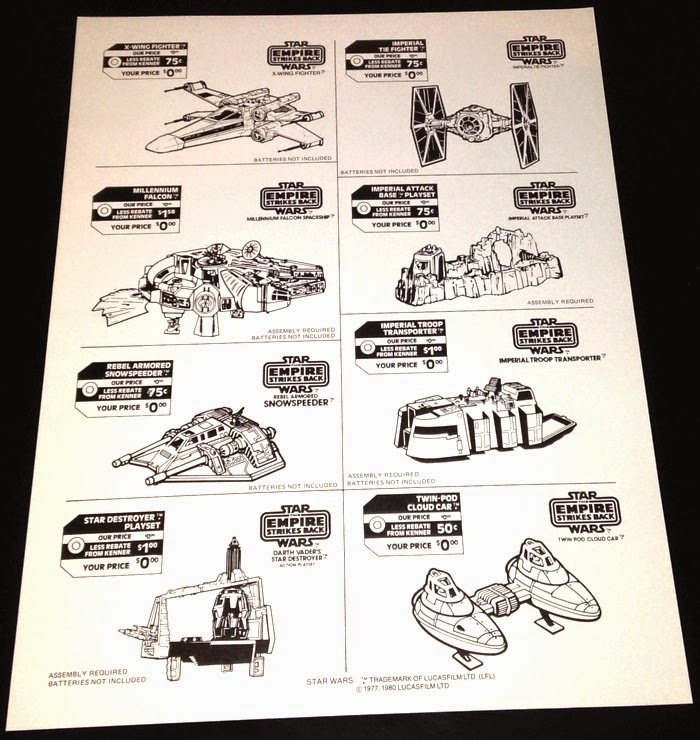 Here you see a sheet that provides line-art images of the action-figure toys on which rebates were offered. Finally, here's an actual ad, which ran in the Sunday comics section of a Memphis, Tennessee newspaper on November 2, 1980. You'll notice that it utilizes some of the elements from this rebate kit. 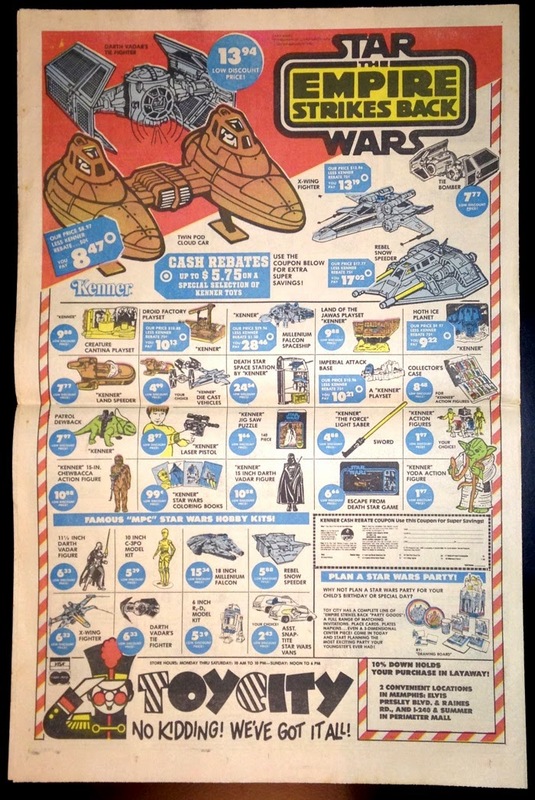 It's pretty cool to see a full-page retailer ad devoted entirely to Star Wars toys. Of course, a lot of the items being advertised were not part of the rebate program; they were just regular old Star Wars products. 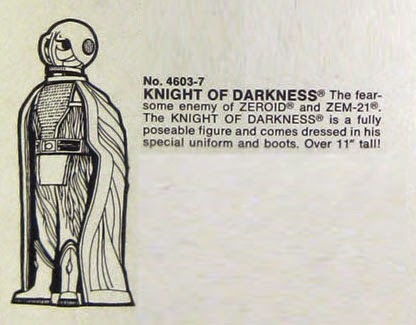 The line-art for these likely came from Kenner's repro art books. 1) The Yoda figure is spotlighted. Yoda would have been the newest action figure in the line at that point in time. 2) Earlier, Star Wars-logo products, like the large-size versions of Darth Vader and Chewbacca, the Death Star Space Station, Land of the Jawas, and the Creature Cantina, were still available. 3) The die-cast TIE Bomber makes an appearance. You sometimes hear that this item was only available in a certain, very limited area, but that's not my sense based on the evidence of price stickers, ads, and old collections. It seems to have been available fairly widely, albeit for a limited period of time and in limited numbers. Any readers remember shopping at the Memphis Toy City? One of my fave websites, Plaid Stallions, has some shots of interiors of Toy City locations here and here. With all the Episode VII "leaks" hitting the internet over the last few weeks and months, I've been thinking back on what was supposed to be the original internet leak. But then wasn't. By the late 80s/early 90s, Star Wars fans were eager for anything which would give them something new. Star Tours was open by that point and the Zahn trilogy was still years off. There was no news from LFL on the release dates for new films and no one really liked The Ewok Adventure. With the exception of a few foreign markets, Star Wars had all but disappeared from the public consciousness. It seemed to be a fad which had all but died out. It was a dark time for the fandom. Around this same time, a document hit what was then the earliest days of the internet, as if delivered from the heavens just when it was needed the most. It had begun its life on the sci-fi convention circuit, somewhere between 1979 and 1983, but by the late 80s it had become an internet phenomena. The document had no real source or origin attached to it, but it was reported to be the original draft for what would be the filming script of Episode III. Except that it was very, very short. And was written by someone other than Lucas. And not particularly good. And was apparently for Episode III rather than Episode I. Calling itself "Fall of the Republic," this strange story was all the rage in fan circles in the 80s and early 90s though. Even into the mid-90s, fans and collectors still knew of the story. They might never have read it, but they still knew that it existed and it formed the basis of many different theories on the film's mythology, even if many doubted its authenticity by that point. As it turned out, Fall of the Republic was not a draft of Episode III. It was just something that someone wrote, which was either accidentally or deliberately presented as genuine by the internet in the first of what would be many Star Wars hoaxes. While it does have several similarities, Lucas took his prequel in another direction and Fall of the Republic was consigned to the ashcan of history. Still, there are those who remember the days when it was the latest news "leaked" from the set of a Star Wars film which the fandom was dying to see. And if nothing else, it's probably the first and best known Star Wars fan fiction around. This article from Cincinnati.com debuted in 2013, but I bet a lot of our visitors haven't seen it. 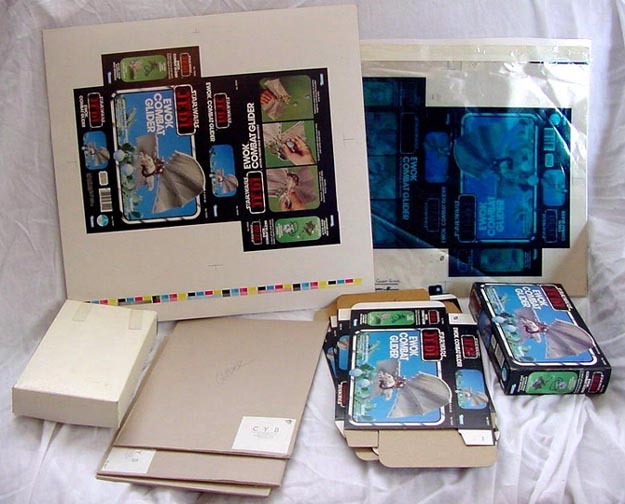 None of the information it provides is particularly revelatory, but it does offer some large, clear photos of Kenner Star Wars product, both on store shelves and in Kenner's Oakley facility. 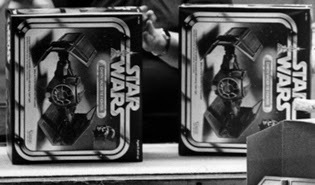 I particularly love the shot of that woman glumly taping Darth Vader TIE Fighters into their boxes. If you had walked up to her and told her to take care not to damage the corners, lest she negatively affect future AFA grades, what do you reckon she'd have done? 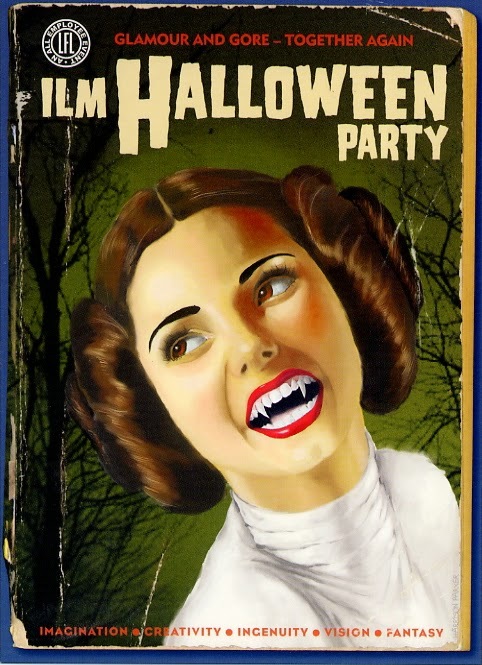 I bet she would have grabbed the nearest die-cast landspeeder and walloped you in the head with it. 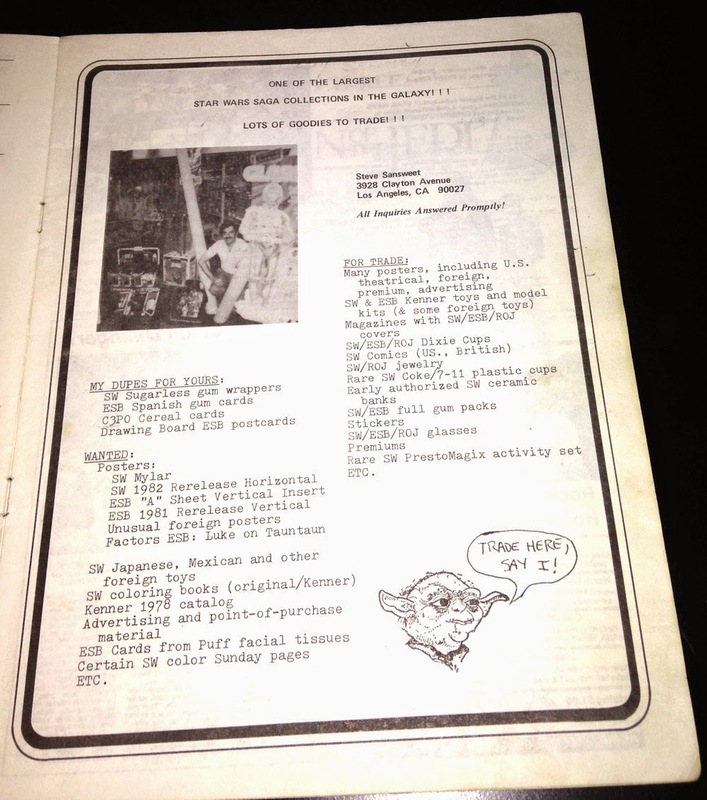 Have you all seen the supercool Kenner paperwork of Ross Cuddie's that I posted on the SWCA back in the spring? If not, you can check it out here, here, here, and here. Ross has a few additional pieces that I've been planning to post. I haven't for a couple of reasons. Secondly, I'm not entirely sure what some of Ross' pieces represent. Take the below item. Clearly it relates to Star Wars action figures. And, obviously, it's connected to the first assortment, which was the 38000 series. But the remainder of its content is somewhat mysterious -- at least initially. Okay, I'm exaggerating a bit: The Jawa reference is pretty obvious. It's a decent bet it's related to the change that occurred in the shape of the figure's blister when Kenner ditched the vinyl-cape version of the toy in favor of the cloth-cape one. On the other hand, the date on this piece indicates it was generated about a month after the change notice that bestowed the vinyl cape on the figure. Did the change from vinyl to cloth happen that quickly? Possibly. If not, then this must relate to some other change in the Jawa bubble -- perhaps one of which we've seen no other evidence. As you've probably noticed, there's another reference to a blister change. As no figure name is indicated, it's hard to speculate about it. Anyone aware of another early blister transition this might relate to? If so, share in the comments. But the references on this change notice that intrigued me the most were the ones to the "corrugated platform," "seperaters," and "top filler." My guess was that they refer to materials used in shipping cases. But when searching around for images of freshly opened SW shippers, I came up empty. For some reason it didn't occur to me that many of the original 12 figures shipped in the bin-style store display -- until, that is, I saw the below photos, which were posted by Robert Daugherty on the Facebook group devoted to Star Wars Displays and Advertising. 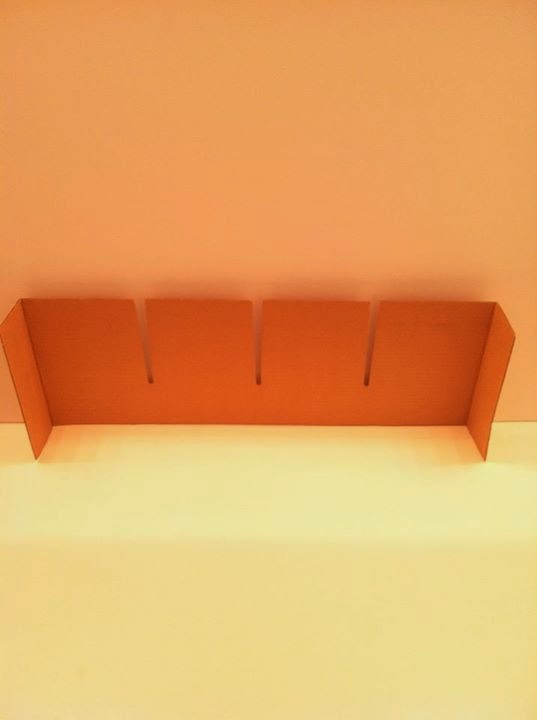 The photos show a 12-back bin-and-header display with all of the ancillary materials intact. 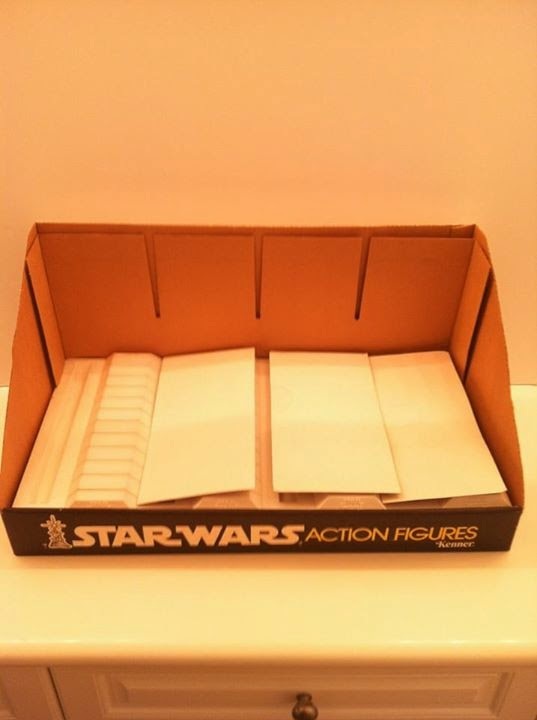 Sure enough, those materials include three cardboard "seperaters"; they were used to keep the three rows of carded figures in place during shipping. 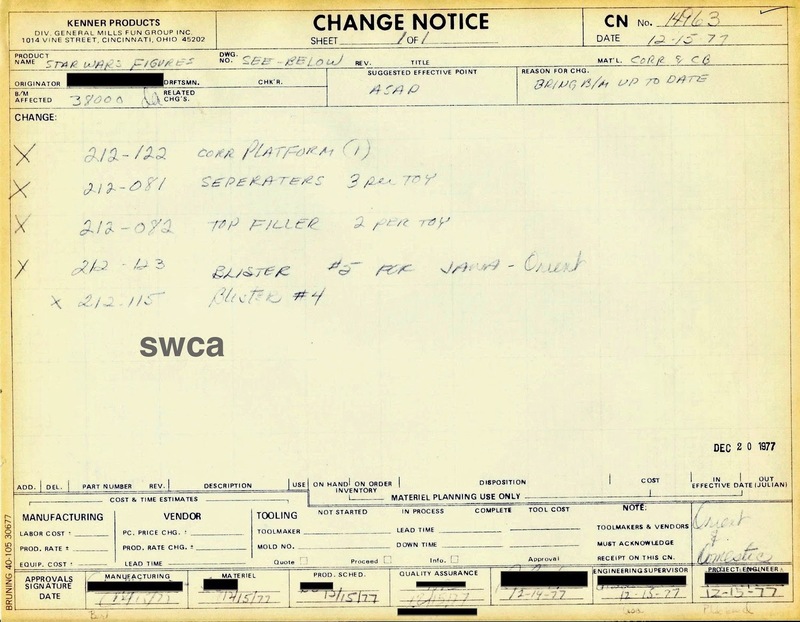 That brown rectangle on which the seperaters sit is almost certainly the "corrugated platform" referred to on the change notice. It was inserted below the display's interior plastic tray in order to ensure the figures and tray were raised above the front lip of the bin. This piece doesn't seem to be mentioned on the change notice, possibly because the folks at Kenner didn't realize they needed it until after they had the seperaters in hand and realized they wouldn't stay in place without support. Anyway, Robert's posting these photos finally clarified for me the significance of this piece of Ross' paperwork. It references the packing materials used to ship the bin display! Eureka! There's one remaining mystery, however. What the heck is the "top filler" referenced on the change notice? Two of them were meant to ship in each case. Are they taking about some kind of padding material? Or is "top filler" their word for the three-slotted piece of cardboard mentioned above? Perhaps two of the three-slotted things were shipped in each case, one for the back of the bin and one for the front? "Top filler" would be a weird term for an item like that, but who knows . . . If you have any ideas, share 'em in the comments. Thanks to Robert and Ross for sharing these items. If you're interested in store displays, you can browse through our gallery devoted to the subject by clicking here. So, what do we think? Is the prop truly worth that or is it just an example of collectors being crazy and inflating the market? 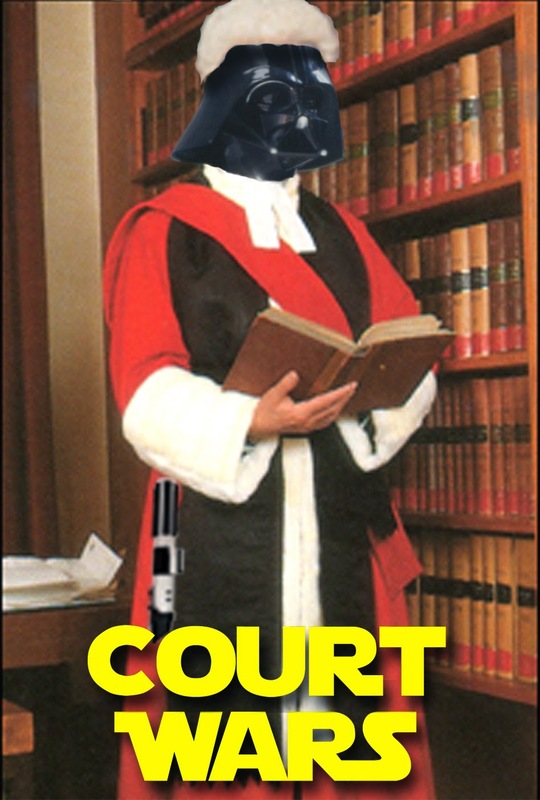 Welcome to Court Wars, an overview of Star Wars related legal cases and lawsuits. 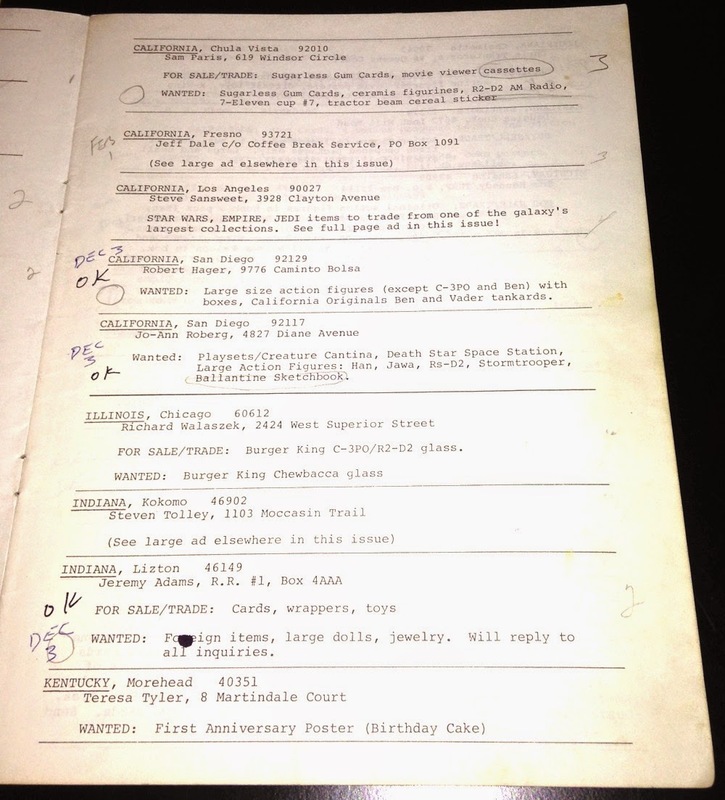 Like most collectors who are also attorneys, from my first day of legal research class, I've been trying to find all the times something collecting related was part of a court case. There are a surprising number of them, so this will probably be a regular blog feature. If you know of any, feel free to send them my way! On 2/15/1979 Brown allegedly took a case of 6 Star Wars Luke Skywalker figures from Kenner Products, his employer, and in the sight of two fellow employees, carried it from the company loading dock and placed it in the trunk of his car. 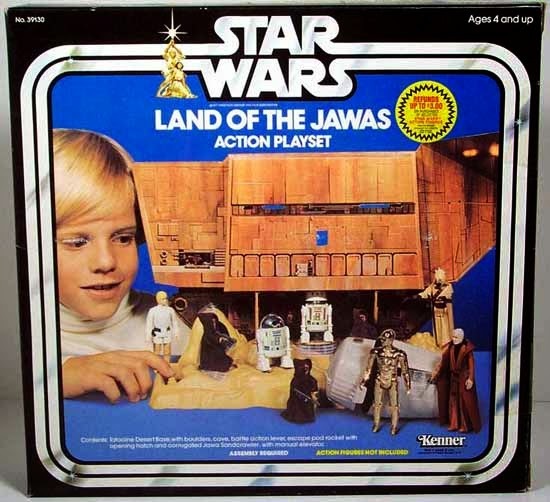 The court of appeals overturned his conviction because the state failed to introduce evidence that the box belonged to Kenner and that the Luke figures had some value. 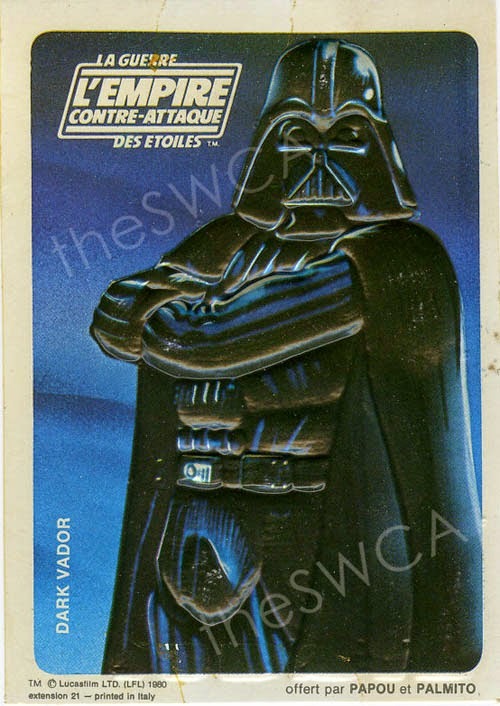 Kenner placed a value of $38.40 on the case though. This is a case concerning a line of figures called "Star Team." Essentially, Ideal Toys is asking the court to tell Kenner that the Star Team line does not infringe on Kenner's Star Wars line. Kenner makes a counter claim against Ideal, saying that the Star Team figures constitute unfair competition. It's the court's job to settle this mess. "TCF (Twentieth Century Fox) has granted, since the end of 1976, more than 20 licenses for 'Star Wars' products, from school supplies and bubble gum to bedspreads and model flying robots. 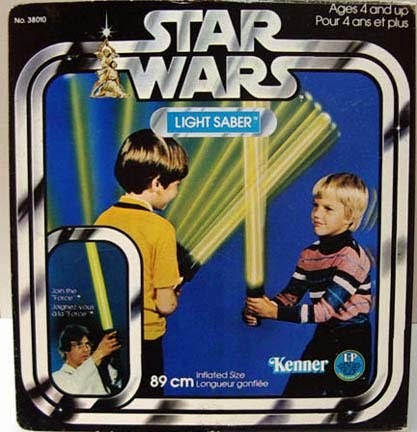 This merchandising campaign included an attempt to interest toy manufacturers in producing 'Star Wars' toys. 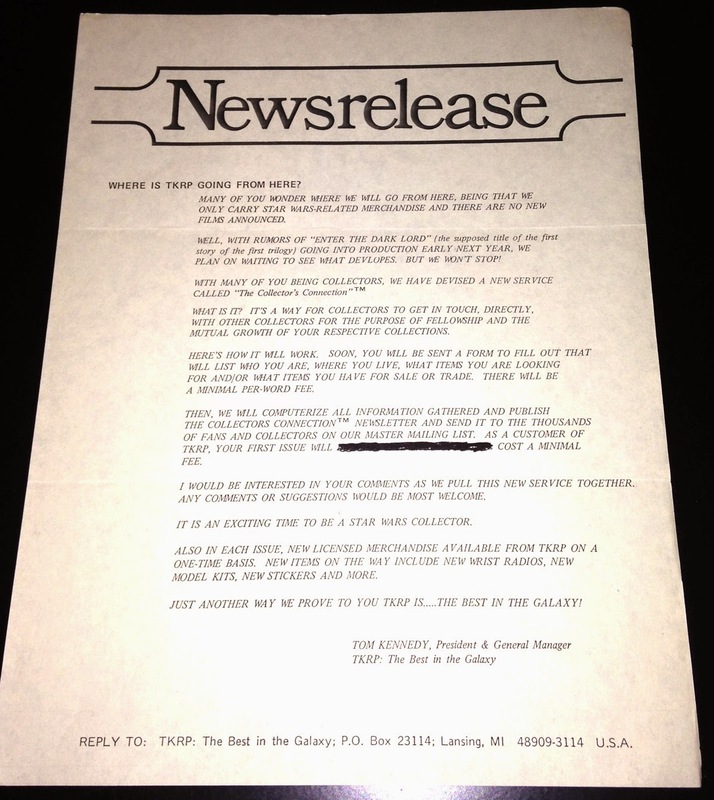 Marc Pevers, Director of Business Affairs for TCF, wrote to an officer of Ideal on February 14, 1977, announcing the upcoming release of 'Star Wars' and soliciting Ideal's attendance at a presentation at the annual Toy Fair in New York in late-February. A similar letter was written to Zeke Rose of Ideal's public relations firm. 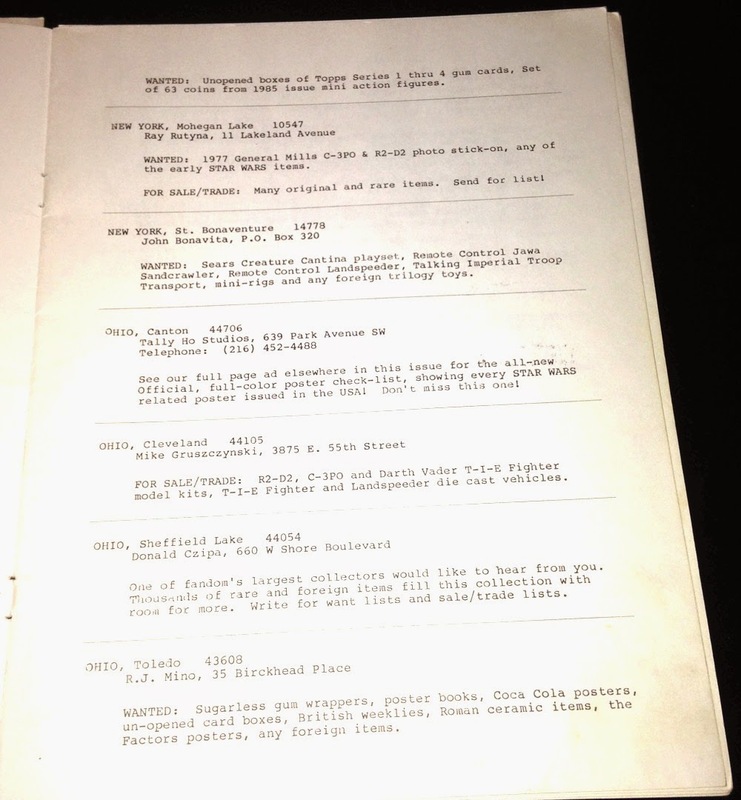 A large, glossy black brochure containing pictures and descriptions of 'Star Wars' was enclosed with each letter. Ideal did not attend the presentation at the Toy Fair, but Rose spoke to Pevers by phone at that time, informing him that Ideal had no interest in the product, that science fiction films were chancy, films themselves (were) risky as merchandising properties because of their frequently short release life. Furthermore, there was no television series and also that Star Wars itself was a rather ordinary property and all the elements of Star Wars had been done before, that there was a complete lack of interest on Ideal's part. Pevers received the same response from Herb Sand, an Ideal executive, and from another member of Ideal's public relations firm. Unlike Ideal, however, Kenner expressed interest in the license and entered into an agreement with TCF in April 1977. 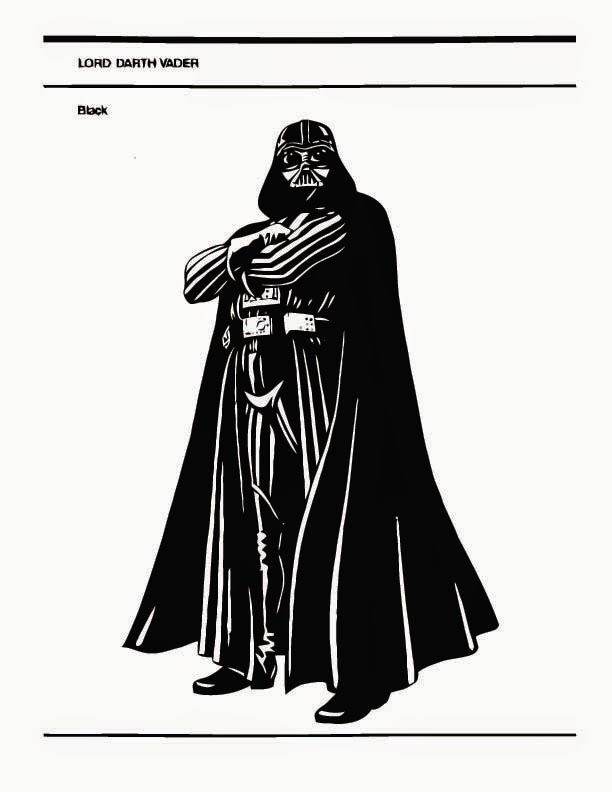 In May 1977, 'Star Wars' was released to critical acclaim and virtually instant popularity. According to Ideal, this acclaim, together with the continued popularity of the television show 'Star Trek,' the publicity surrounding the American space shuttle, the expected release of other space movies, and the fact that other toy companies were bringing out space toys, led Ideal to reexamine its opinion of such toys. Julius Cooper, Ideal's Senior Vice President for Research and Development, testified that the market for toys is very much affected by fads and trends, which often originate in a motion picture, a television show or a 'happening.' Mr. Cooper stated that 'the toy industry tries to capitalize on these events because children are very well aware of what is current and we therefore always try to bring out toys, games, dolls that take advantage of these fads.'" "In late-June, Pevers met with Stuart Simms, a marketing executive with Ideal, to discuss a TCF series called 'Young Daniel Boone.' Simms, however, opened and closed the meeting by asking whether there were any licenses available on 'Star Wars' which would interest Ideal. Pevers indicated that no such licenses remained." "At the end of May, however, Ideal determined that it was necessary to capitalize on the space toy fad as quickly as possible. Accordingly, Cooper testified, Ideal 'decided to go back into (its) old archives of tools and molds and see what toys (it) perhaps could make with the least amount of investment.'" It should be noted that not all toy companies at the time operated under this regulation, such as Kenner's Rocket Firing Boba Fett prototype, which was ultimately canceled in part due to a choking death related to a missile fired from a Battlestar Galactica toy. Although this case is taking place years before that fatal incident, the possibility of such a tragedy is already on Ideal's mind. Cynics might also argue that Ideal is attempting to cut costs to the bone in this new line, and a rocket firing mechanism would be too expensive for them to produce anyway, but framing it like a moral stand they are taking probably sounds better from a public relations standpoint. They're not cheap; they're protecting children! Personally, I think that's the best reason for choosing a particular mold that I've ever heard. They sculpted a completely new head for the figure and molded the body in a different color plastic. So, now Ideal had two figures ready to go in their new space line. They wanted at least one more though, so the process continued. 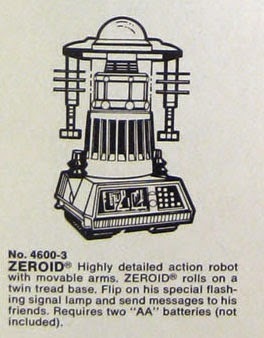 “Having chosen two robot friends, Ideal decided that a complete line of toys required a third figure to create an adversary relationship with the two robots and thus sought to find a ‘bad guy.’ Again the archives were examined, and Ideal selected a figure known as ‘Captain Action.’"
They molded the body in a different color plastic, then instructed their sculpting department to create a new head and that the sculptor should: "...(m)ake up your own fantasy of what kind of a villain you want with a black head to go with a black body." So, we have one figure chosen because it was cheap, one chosen because that particular mold was the easiest to access and now one which was chosen because it was tall. To top it off, the sculpting department was given instructions which were basically "Meh. Do whatever you want." Again, the more cynical collectors among us would probably argue that the instructions given to the sculpting department were actually probably something like: "Just do something that looks as close to Darth Vader as you can get without sculpting Darth Vader." “...The name given to the evil figure was 'Knight of Darkness.' Cooper testified that the name had first been used for a 'black knight in a very modern black knight type of outfit' who was intended to be part of a series of ‘villainous motorcycle riders.'" Kenner does not like the figures. Or the names. Or the box design. 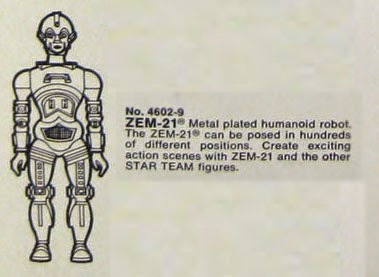 To them, everything about the line seems to indicate that it was designed to be easily confused with their Star Wars merchandise and beat Kenner to market with figures. They think Ideal has designed a line which consumers will assume is somehow related to Star Wars. 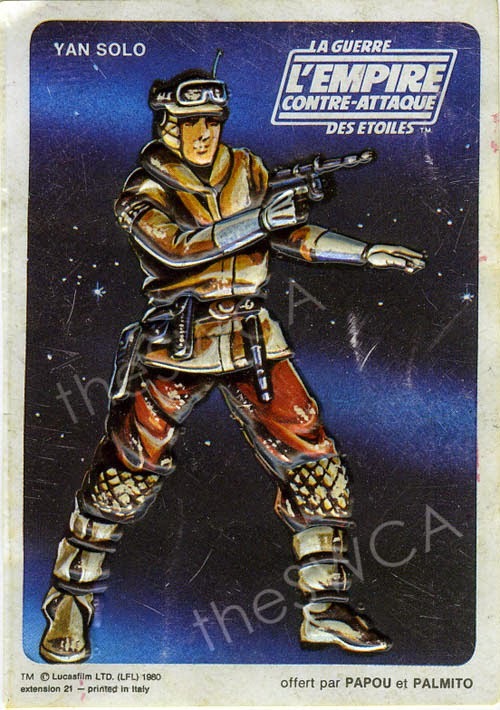 The Star Team line was seemingly rushed through production, with no real thought given to anything but low cost, and choices were made in the design process which made the toys look a great deal like licensed Star Wars items. Kenner objects to Ideal about the line either during a meeting such as the one Fox had with Ideal about the box design, or directly through a cease & desist letter (the court record isn't clear on that point). Ideal believes the toys are fine though and apparently tells Kenner that no changes will be made. Ideal must have still been worried about being sued though and filed this declaratory judgment action to have the court decide the matter and put the issue to rest. Kenner still feels that the toys are knock-offs and files a counterclaim against Ideal, saying that Kenner challenges: "...these three figures and the manner in which they are sold as unlawful usurpation of their rights in the movie 'Star Wars.'" "...(I)t's my opinion that the amount of merchandise offered to the consumer and perceived by the consumer as falling within a licensed property, the greater amount of merchandise offered the greater the dilution and the shorter the life of that property." 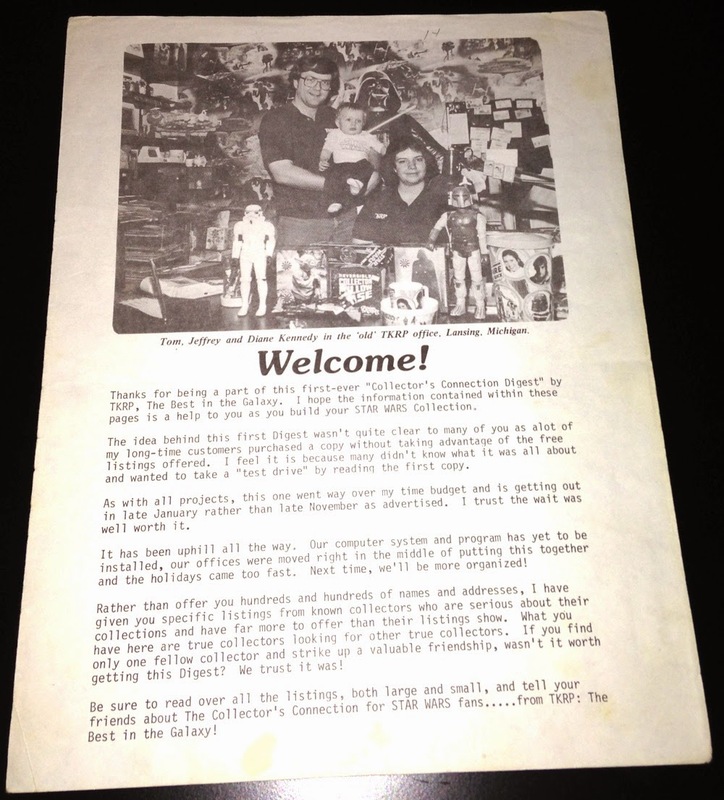 "...represents to the trade that the Star Wars characters are not unique and are not totally offered by Kenner Products and that this perception weakens the degree of support that the trade will give the Kenner products." "...entirely credible the explanation given by Cooper concerning the changes that were made in preexisting toys and the reasons for developing these toys. Certainly Cooper was aware of 'Star Wars' and intended to capitalize on the fad which it was creating. He was also concerned with possible infringement and instructed those developing the toys to avoid copying the 'Star Wars' characters." "...the effect of the sales of Ideal toys on Kenner toys is pure speculation; no objective evidence has been presented that the Ideal toys have weakened or will weaken the market for the 'Star Wars' movie or product derived therefrom." So, Ideal got to continue producing their figures. Collectors have different opinions on whether or not the line is truly a knock-off or not, but in either case, it's interesting to see the drama behind it. As a last note on this case, there was actually a survey performed on this issue by one of the parties, which found that of 422 children surveyed, 65% made an "association" between Star Wars and Star Team. Of the 426 adults who took part in the study, 59% made an "association." This case concerns the Star Ballz film. LFL sued over an animated Star Wars pornographic film that was/is being marketed at conventions and the like. LFL loses the case based on parody protections. Best part of case is the judge's comment: "In this case, no reasonable consumer is likely to be confused between Star Wars and Starballz, which is labeled as an adult film, is animated, and is rarely sold in the same marketing channels as Star Wars." It's a rather complicated tax law case, but it includes a neat rundown of the exact business process behind the manufacture of Kenner's boxes during the vintage era. "Appellant, General Mills Fun Group, Inc., Kenner products Div., a manufacturer of toys, purchases boxes to package its products for marketing. 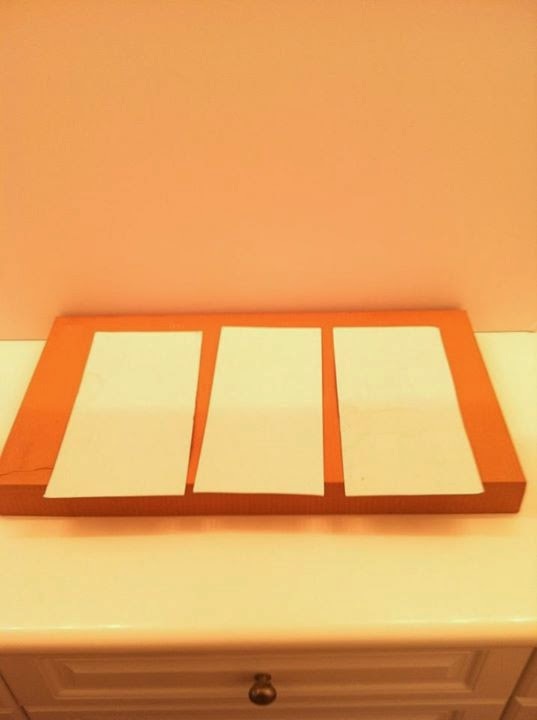 In order to acquire the desired boxes, appellant first purchases artwork from outside suppliers. This artwork is then transferred by appellant to lithographers for their use in the preparation of color films known as 'color separations.' The color separations are sold to appellant by the lithographers, and the artwork is transferred back to appellant. Appellant retains the artwork and transfers the color separations to a box manufacturer which uses them to produce printing plates. 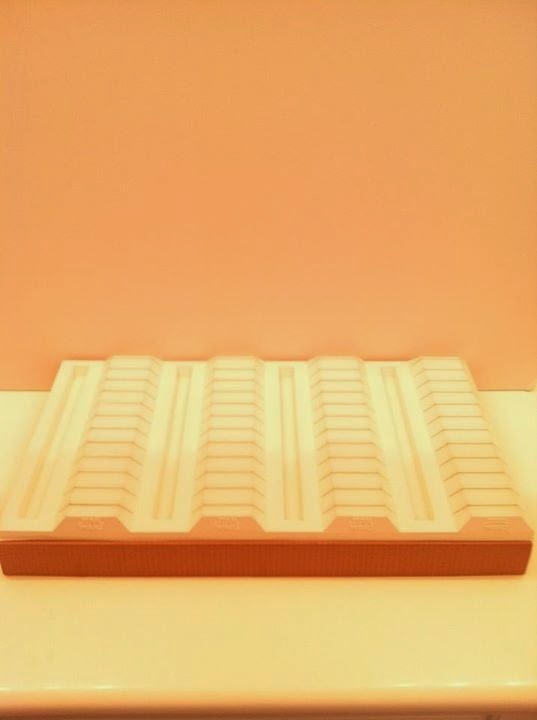 The printing plates are used by the box manufacturer to imprint an image or descriptive information about the toys on the boxes. The boxes are thereafter sold to appellant for use in packaging the toys." "Additionally, the commissioner levied an assessment on appellant's purchase of wax figures or sculptures which are used as models for the products appellant manufactures. After appellant purchases these sculptures, they are delivered to an outside supplier who uses them to make molds or casts. In the process of producing the casts, the wax figures are destroyed." Essentially, Kenner is saying that they shouldn't have to pay taxes on this stuff because: "...its purchases of artwork, color separations and sculptures are exempt from sales and use taxation because it 'resold' those items to outside suppliers." They lose and are forced to pay the taxes on the boxes and sculpts. 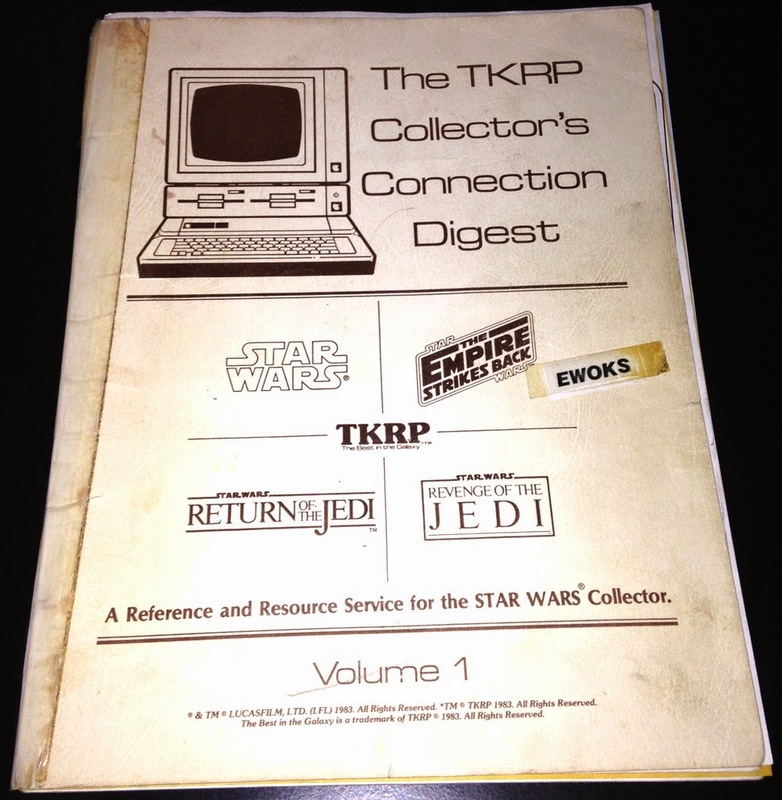 This RebelScum post, by darthalvin, and Tommy's recent post on collecting forum history reminded me of TKRP. Are readers aware of TKRP? The acronym stood for "Tom Kennedy Radio Productions." 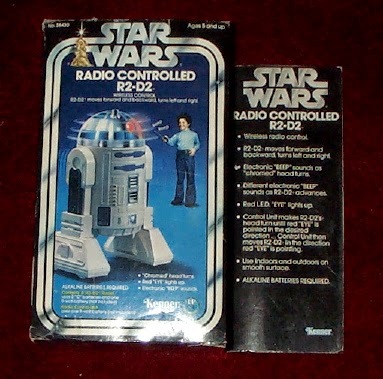 The company was an early hub of Star Wars-related merchandising and communication. I'll probably do a few posts on TKRP. Today I want to focus on their "Collector's Connection" publication, which to my mind is about the most interesting thing they put out. As such, the publications are a treasure trove of interesting collecting history. Let's take a look at some related ephemera. Above you see the original announcement/advertisement for the service. It speaks for itself. Here's another announcement. The fun thing about this one is that it references a rumored prequel film called Enter the Dark Lord. Either that rumor never came to pass or I've completely missed out on a fairly significant piece of the Star Wars puzzle! I think it's pretty evident looking at this ad that at this stage Kennedy wasn't entirely sure where to take his enterprise now that the Star Wars phenomenon had wound down and the flow of licensed merchandise had slowed to a trickle. 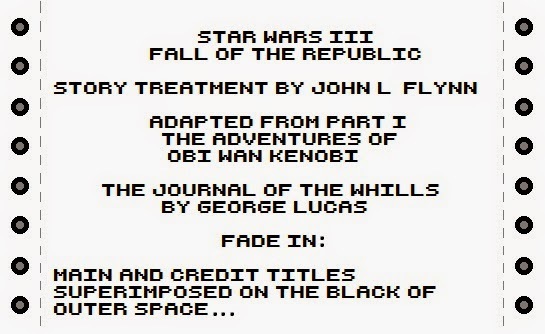 The cover for the first issue featured the logos of each film plus that of Revenge of the Jedi. The guy from whom I acquired it taped "EWOKS" on there. I have no idea why. The issue featured a welcome message from Tom Kennedy, which included some notes regarding a publication delay and assorted other difficulties. That's Kennedy and his family in the image. The biggest collector around in those days was Walter Stuben. His ad is particularly ostentatious. This is a xeroxed copy of the spot that was inserted into the publication, like a flyer. Judging by the reference to 1984, I think it's a later version. But all his ads were pretty similar, even if the lists of items changed a bit. One interesting thing: he's looking for a "Rocket-Firing Boba Fett." Did he believe some had been released? Or had he caught wind that some prototypes existed in the hands of Kenner employees? Stuben had had some interaction with Kenner, so the latter scenario is a possibility. More about Stuben in a later post. A typical page of classifieds, including one belonging to some guy named Sansweet. Those markings in the margin are notes related to deals between the source of the pamphlet and the authors of the adjacent ads. Here's the large ad that Steve references in his classified. Hey, if you have some extra coloring books you should drop him a line and see if he still wants to trade! Another full-page ad. 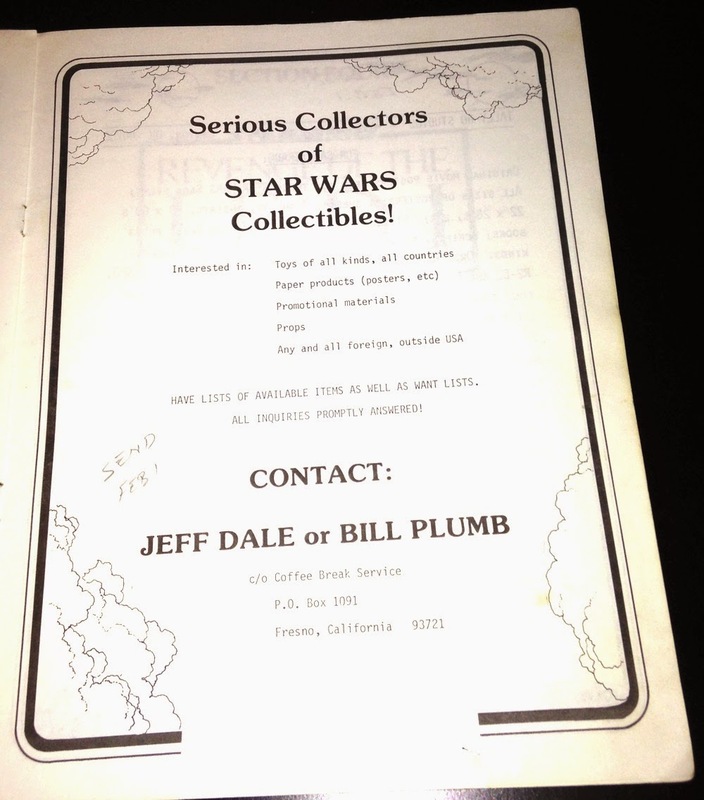 Bill Plumb became one of the preeminent collectors of Star Wars artwork. This ad is from the second edition of "Collector's Connection." Husband-and-wife team Mitch and Chris Mitchell were among the biggest collectors around at the time. They were out of it by the early '90s. 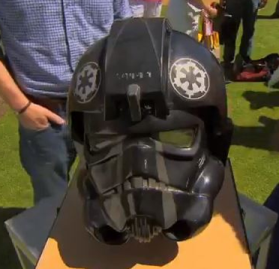 I think you can be pretty sure that some of their collection now resides at Rancho Obi-Wan. For me, the publication is fun in part because it's filled with the names of collectors who were long-timers by the time I got into the hobby around 1993. Some of them I later met in person; others I know only through stories. 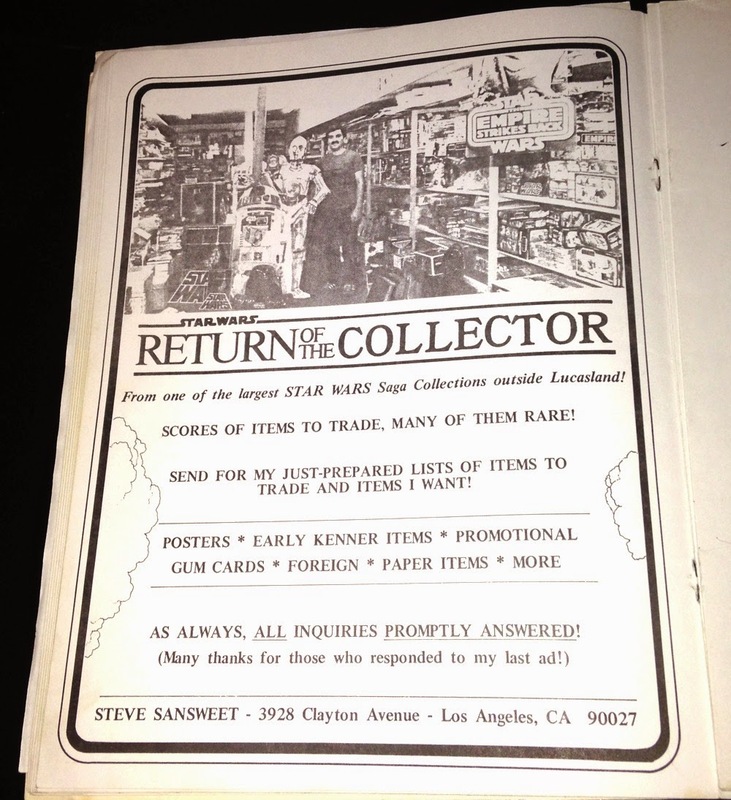 Steve's second full-page ad shows him standing in his old collecting space. Finally, here's another look at the classifieds content. Lots of familiar names here . . . When I got this material from a long-time collector he told me all about writing the folks in these classifieds, trading dupe lists, etc. Most of this he did via the postal service -- and he had stacks of old correspondence to prove it. I tried to convince him to sell me the old letters, but he said they were too personal. Too bad. It would have been fascinating to look through them. 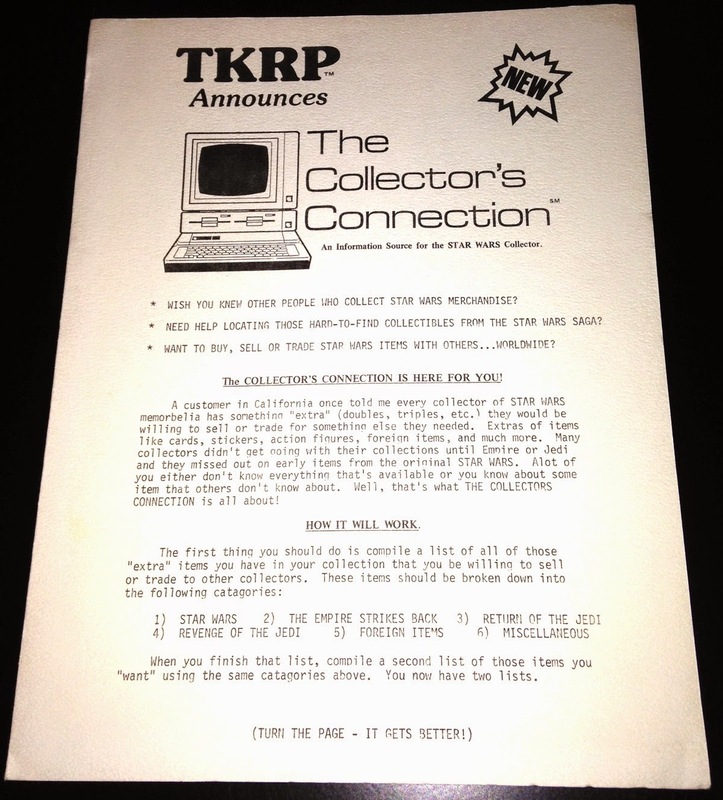 Ultimately, the internet made publications like "Collector's Connection" superfluous. 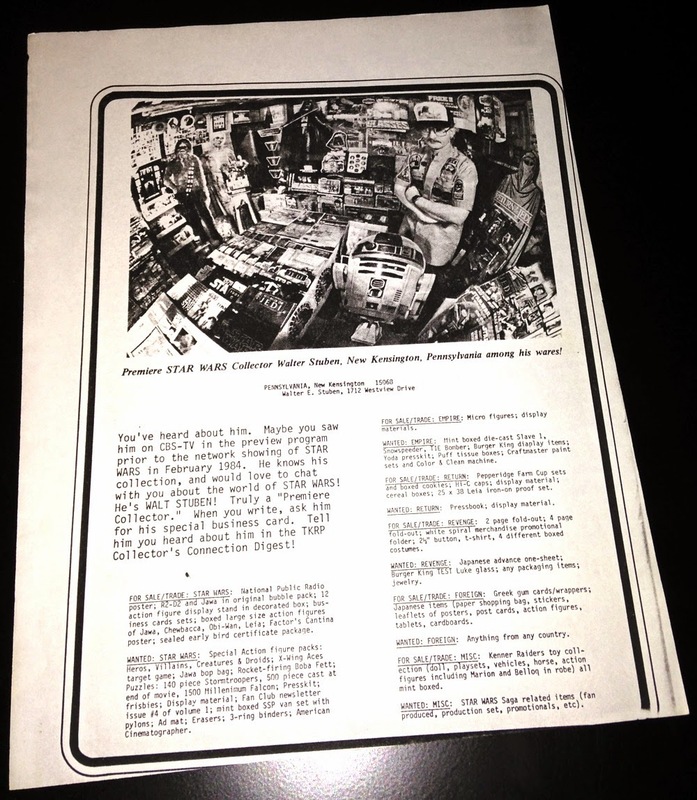 It even killed off "Toy Shop," which was a sort of successor to "Collector's Connection" -- and still the most popular collecting forum when I started in the hobby. In a way, the SWCA is part of this narrative: It was intended to allow collectors to share their collections with colleagues the world over, without the cost and wait time associated with travel and snail-mail. As you cruise through eBay listings and peruse far-flung collections with the click of a mouse button, don't forget to reflect on how fortunate you are to be living in what I like to think of as THE WORLD OF TOMORROW.